Sleek brushed finish layered with a fine textured film make the hard shells scratch and wear resistant. The result is beautiful luggage that stays looking newer longer. 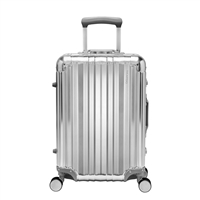 The Ricardo Ocean Drive 21 inch Spinner Carry-On in Silver is legal size for most domestic flights. The Ricardo Ocean Drive 19 inch Mobile Office in Silver is equipped to handle up to a 15.5 inch laptop. The Ricardo Ocean Drive 19 inch Mobile Office in Sandstone is equipped to handle up to a 15.5 inch laptop. The Ricardo Ocean Drive 25 inch Spinner Upright in Silver is ideal for a 4-7 day stay. The Ricardo Ocean Drive 25 inch Spinner Upright in Sandstone is ideal for a 4-7 day stay. The Ricardo Ocean Drive 29 inch Spinner Upright in Silver is ideal for a longer stay. The Ricardo Ocean Drive 29 inch Spinner Upright in Sandstone is ideal for a longer stay. Designed for the travel tastemaker, this carry-on spinner case from our sleek Aileron collection delivers the ultimate in durability. Nestle your travel wardrobe in the shimmering metallic interior, appointed with tie-down straps and a convenient compartment divider. This mid-size spinner case from our innovative Aileron collection delivers high style on the airport concourse. Looking for a specific Ricardo Beverly Hills hardside bag? Please don't hesitate to ask and we will find it for you!